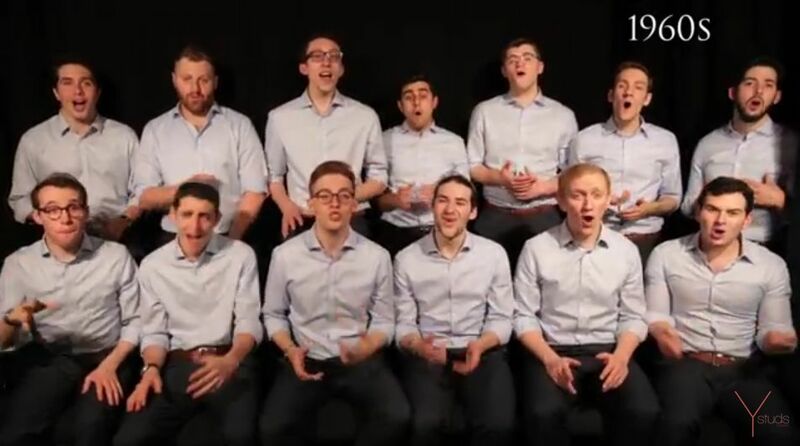 The Y-Studs, the Yeshiva University a cappella group, has produced a video chronicling the evolution of Jewish music from the 1600s to the present day. Starting with a brief synagogue melody from the 9th century, the collection jumps to 1600 and a series of 37 songs that paint a musical picture of familiar and most loved Hebrew and Yiddish songs. The collection includes liturgical, secular, and songs from Broadway and popular music. The list of songs appears below the video. Wouldn't it be great if you released a full album of all the songs in its entirety. Fabulous. Thank you for making my day. Thanks guys, great offering. I especially enjoy Quando, and wonder if there are other non-Ashkenazic songs of, um, note. Which? All! With complete liner notes, please. Shanah Tovah to you as well. Release them all! Then let me know how I can purchase each. Outstanding in every possible way! An absolute joy to listen to. Great fun!!!!! Fabulous!!! Love them all! Ofyn Pripichek is a favorite. GREAT harmony and enthusiasm! That made my night. You guys are so talented. Just beautiful. i would love an album of these songs. Hearing them all made my day. At the point when my folks opened a music store in San Clemente California called the Maria Del Arte Music Center and, in the end, the adjoining Four Muses Folk and Rock club, I figured out how to play a couple of harmonies and helped shape a surf band, The Exceptions, with three or my pals in sixth grade. Playlist Promotion Get on Spotify playlists now.